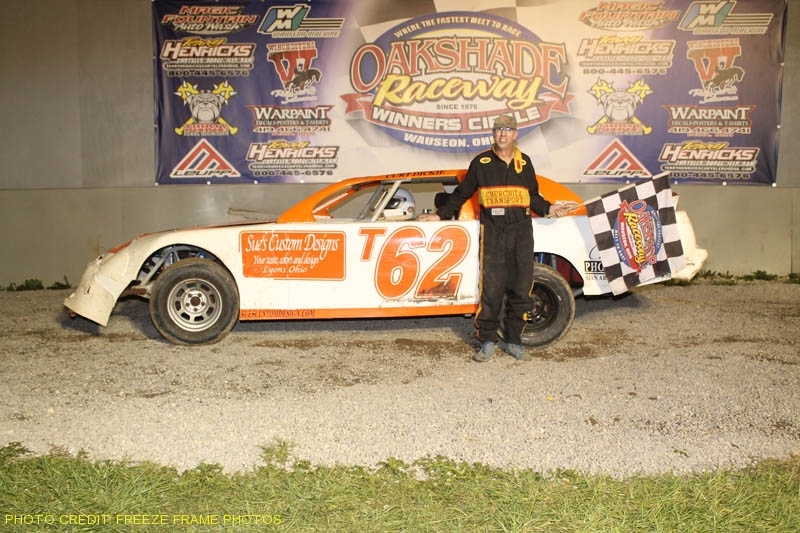 Kris Patterson continued his winning ways at Oakshade Raceway by posting his fifth late model feature win of the year. An exciting finish to the sportsman feature also highlighted a spectacular night of racing. In the late model feature, Patterson took that lead at the drop of the green flag after staring alongside Justin Paxton on the front row. Jerry Bowersock moved into second with Paxton third and Rick Delong fourth and they would continue in that order for much of the race. Around lap six, Greg Martin got loose coming off turn two in front of a crowd of cars and stacked things up behind him with Tim Wright on the short end of things, ending up in the backstretch wall. Wright was able to continue. Then on lap seven, the red flag flew after rookie late model driver, Devin Shiels, rolled his car over in turn two. He was uninjured. The top four of Patterson, Bowersock, Paxton and Delong broke away from the rest of the pack and remained in that order until the final few laps. That’s when Johnson’s car began to suffer mechanical problems and started to slow. Paxton and Delong got by to move up to second and third respectively, but Kris Patterson went on to pick up the victory uncontested. Paxton finished second, Delong third and Casey Noonan came across the finish line in fourth. The sportsman feature produced one of the most exciting finishes of the night. It started out with Ray Klaywitter opening up a large lead early on, with a lot of three wide racing behind him back in the pack. Devin Shiels, who was doing double duty racing in the late models and sportsman divisions, got by Tim Bernard for second and began to reel in Klaywitter. Shiels kept trying to get to the outside of Klaywitter but could not get alongside. While they battled for the lead, Brad Kendall closed in to make it a three-car battle out front. Then, as the leaders took the white flag, Shiels got up alongside Klaywitter to take the lead. Klaywitter did not give up and took the lead back in turn two on the final lap, and then coming off of turn four, Devin Shiels, who rolled his late model over in the previous race, got by Klaywitter again to win his second sportsman feature of the year. Brad Kendall held on to a third place finish followed by Evan Myers and Joe Derbeck. Troy Wickman appeared to be the man to beat in the bomber A Main taking the lead after starting on the pole. Just behind him was a lot of jockeying for position. Tom Ordway was all over Wickman’s back bumper for much of the race but could not find a way around. Then with just three laps to go, Wickman’s car broke and came to a stop in turn two, turning the lead over to Ordway. Ordway held off Brad Miller and Ted Goetz Jr. to win his first bomber A Main of the year. Danny Hogrefe led most of the bomber B Main with Billy Ruff running second. Ruff spun in turn two with just five laps to go ending his run amongst the leaders and then Danny Hogrefe suffered even worse luck when he took the white flag and his engine let go. That turned the lead and the victory over to Curtis Lancaster. Josh Steinacker finished second and Chuck Leininger was third. There was a lot of good four wide battles early on in bomber C Main. Out in front of all that action was the 68 of Rich Risner, but Risner retired to the pits just four laps into the event. That turned the lead over to Russell Nickoloy. Nickoloy held off a challenge from Jody Burton for the lead and then Burton got loose and slipped back to third behind Jeff Proffet. Burton eventually got back around Proffet for second. Nickoloy had built up a huge lead and on the final lap in turn four with the checkered flag in sight; Nickoloy got crossed up and came to a stop. Burton drove by the stopped car of Nickoloy and won the bomber C Main. Proffet finish second, Jeff Potridge was third and Gene Potridge came home fourth. More great late model, sportsman and bomber racing will be on tap for this coming Saturday night at Oakshade Raceway.